Awesome Mix | Becoming Star-Lord. Star-Lord cosplayers have found various ways to deal with Peter Quill’s Walkman. Although it seems like an ancillary prop, it is definitely part of what makes Star-Lord…well, Star-Lord and most people have been loathe to ignore it. Well, depends. Depends on the Walkman. I’m sure there are plenty of cheap, portable cassette players which one could find on eBay for pennies. 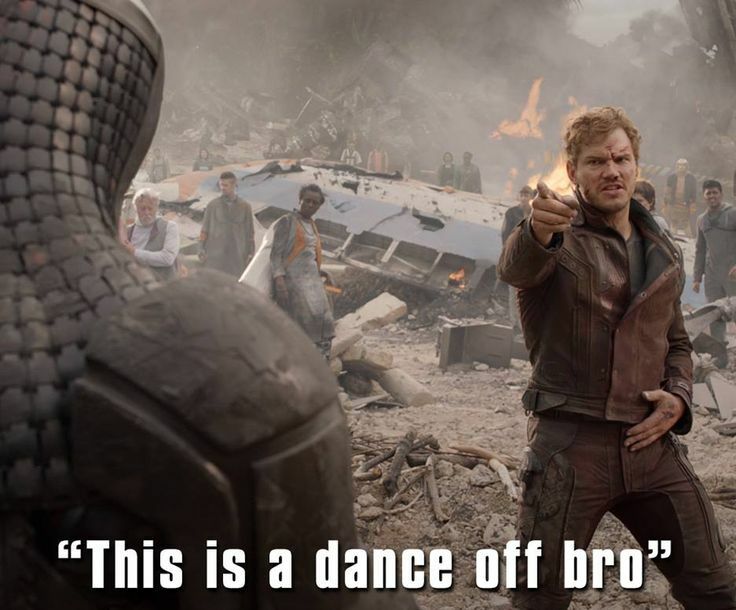 But Star-Lord’s Walkman was no cheap player. When Peter Quill was snatched by the Ravagers, he brought with him his Sony TPS-L2, one of Sony’s earliest models. The first Sony Walkman, actually. Made in 1979, the TPS-L2 was sought by audiophiles long before Guardians of the Galaxy was even pitched. Moderately expensive even before Guardians, screenshots of Chris Pratt wearing the TPS-L2 drove prices through the roof. Guardians fans and Star-Lord cosplayers were desperate to get their hands on it. Prices on eBay ranged from $200 (for broken devices) to $800 (for working versions). Wow. 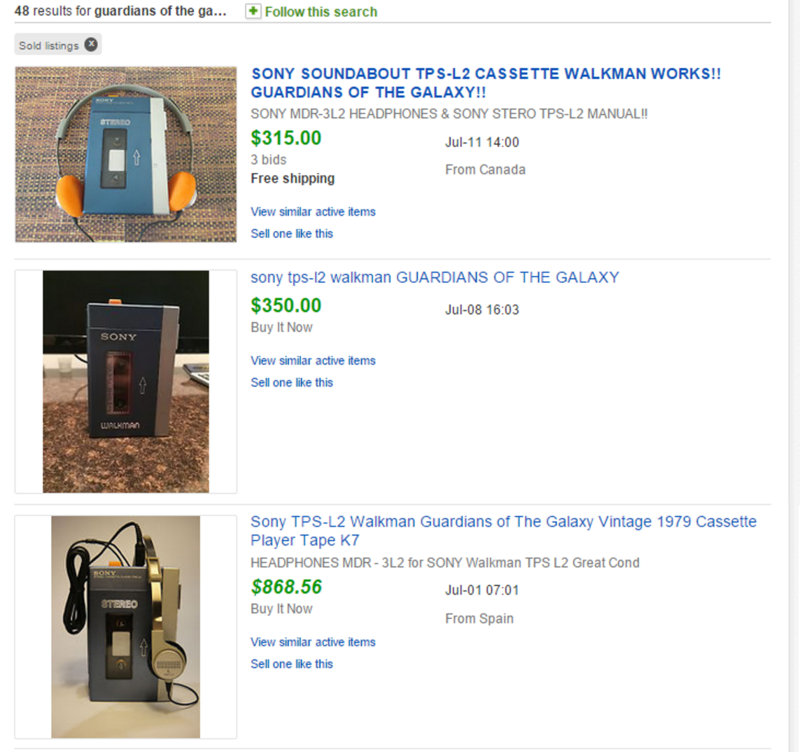 (check this article: Price for “Guardians of the Galaxy” Walkman Skyrockets on eBay). This is a graphic from http://www.80sretrotoys.com. It’s a cool site. You should check it out. Get a cheap Walkman and go with it. Trust that no one would know the difference. Stickers. Fans have created stickers which can make a box of the appropriate size look like Peter Quill’s Walkman. I actually received some stickers with the headphones I ordered. 3D printing. I could order a 3D printed Walkman (available on Etsy) and paint it the appropriate colors. Fun. Maybe. Buy an actual 1979 Walkman. A broken one would set me back about $180 and a working one, well, probably around $400 minimum. At first, I had decided to go with a 3D printed model for the costume. It would have cost about $30. Just for fun, though, I decided to keep my eye on eBay to see what the actual models were going for. Many working Walkmans (Walkmen?) were selling for $300+. A few sellers had listed theirs for around $500 or “best offer.” I annoyed a few of them by throwing some $100 best offers out there and crossing my fingers. No dice. These are a few TPS-L2s that sold within the last 90 days on eBay. If you see one of these in a thrift store, buy it. Most sellers realize that their device is not only a collectible piece of audio history but a highly sought after prop necessary to produce screen accurate Star-Lord costumes. Consequently, they list “Guardians of the Galaxy” somewhere in the title or subtitle. This seller didn’t have “Guardians of the Galaxy” anywhere on his listing. Maybe he didn’t know what he had? Anyway, I bought it. This was a deal. Honestly, I could turn around and list this device for double what I paid for it on my eBay store…and it would sell. Fast. Yes, it is expensive. But it’s also an investment. With the release of Guardians of the Galaxy 2 coming, the value is not going down any time soon. I figure, if I need the money, I can sell this, make a profit, and donate the profit to CASA. So, after a few days of waiting, I received the Walkman. Today. You can check it out in the video below. Unfortunately, it isn’t working perfectly, at the moment. I tested it with one tape and the sound is coming out a little warped. I’m really hoping it’s just the tape. I’ll keep you posted! This entry was posted in Awesome Mix, Props, Walkman and tagged awesome mix, Chris Pratt, cosplay, costume, dance off, disney, guardians of the galaxy, Marvel, music, props, Star-Lord, Starlord, Superhero, Walkman on July 14, 2015 by Liam. How Awesome is the Awesome Mix? Is this an ancillary prop? Absolutely not. 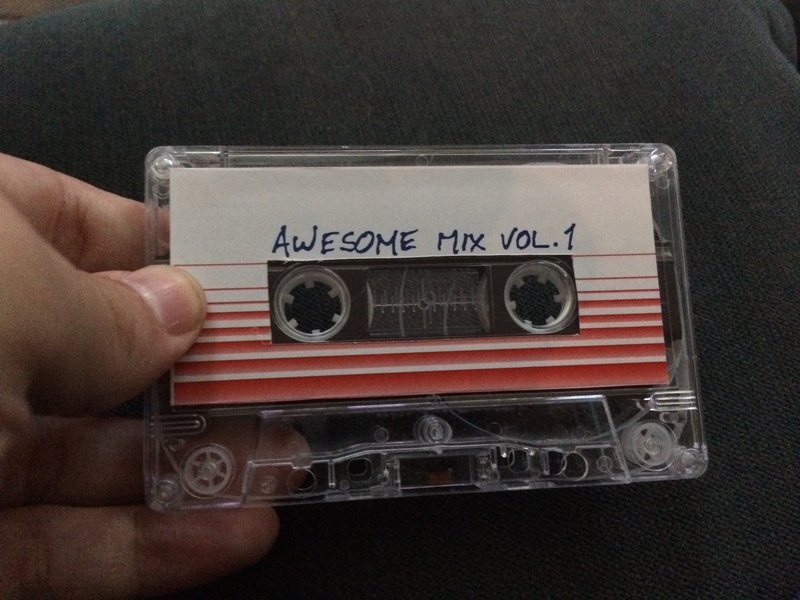 Peter Quill would not be Star-Lord without the Awesome Mix. These songs were his link back to Earth, to his childhood. These songs influenced him growing up. These were the songs he listened to during the most important moments of his life. These were the songs he learned to dance to. Music both influences our perception of Peter and directly affects his path toward self-definition. Some of the tracks which accompany scenes that demonstrate this include “I’m Not in Love”, “Come and Get Your Love”, “Hooked on a Feeling”, “Escape (The Pina Colada Song)”, “Fooled Around and Fell in Love”, and “Ain’t No Mountain High Enough.” Together, they represent the culmination of Peter’s efforts to free himself from his ravager identity and the trauma of losing his mother. Awesome Mix Vol. 1 provides great insight into Peter’s developing identity as Star Lord, not in an explicit story told through lyrics but in his reactions to it within context. Therefore, I feel like I wouldn’t be properly channeling Star-Lord without this tape. So here it is, fresh out of the mail! Photo Credit: Me. All me. The label is an exact replica of the movie label. Now here’s the sad part: it doesn’t actually play. No songs on this cassette tape. It will serve, though. If you are interested in how Peter’s music is a reflection of his personality, you should read Constellation’s post, “Becoming a Guardian of the Galaxy: Star Lord and the Importance of Music.” It goes through each song, describing how it contributed to Peter’s evolution into Star-Lord. An excellent piece written by a creative writing student. This entry was posted in Awesome Mix, Props and tagged awesome mix, cosplay, dance off, guardians of the galaxy, Marvel, music, props, Star-Lord, Starlord, Superhero on June 12, 2015 by Liam.